Duavive (oestrogen/bazedoxifene) is the first menopause treatment option to contain a selective oestrogen receptor modulator to counteract the endometrial stimulatory effects of oestrogen. Duavive is licensed to treat oestrogen deficiency symptoms when progestogen-containing therapies are not suitable in postmenopausal women with a uterus who are at least one year after their last period. The conjugated oestrogens in Duavive are primarily the sulfate esters of estrone, equilin sulfates, and 17α/ß-estradiol. These replace the oestrogens lacking after the menopause. The selective oestrogen receptor modulator bazedoxifene acts as an oestrogen receptor antagonist in the uterus and thus reduces the risk of endometrial hyperplasia associated with unopposed oestrogen treatment. The combination is known as a tissue-selective oestrogen complex. In standard combined HRT combinations the endometrial effects of oestrogen are opposed by the presence of a progestogen. "The tissue-selective oestrogen complex concept represents a new paradigm in menopause management," said Dr John Stevenson, Consultant Physician and Endocrinologist at the Royal Brompton Hospital, London, and Reader in Metabolic Medicine at Imperial College London. 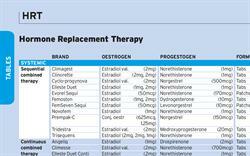 "For most women, any problems that arise from HRT result from the progestogen component, and this new HRT dispenses with progestogens." In the randomised, double-blind, 12-week SMART-2 study in postmenopausal women aged 40-65 years with moderate to severe hot flushes (n=332), conjugated oestrogens/bazedoxifene significantly reduced the number and severity of hot flushes at weeks 4 and 12 (p<0.001). At week 12, the incidence of hot flushes was reduced by 74% from baseline (10.3 vs 2.8) compared with a reduction of 51% (10.5 vs 5.4) for placebo. SMART-1 also evaluated the effect of conjugated oestrogens/bazedoxifene on menopausal symptoms. 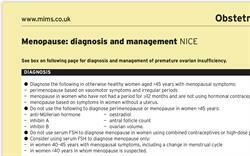 The double-blind, placebo- and active-controlled phase III study involved healthy women aged 40 to 75 years with a uterus, who were at least 1 year post menopause (n=3397). The women were given either conjugated oestrogens/bazedoxifene, raloxifene 60mg or placebo once daily for 2 years. Results showed that all patients receiving the combination experienced significantly greater relief of hot flushes at most time points than those receiving placebo (p<0.01). The combination group also experienced significant decreases in the number and severity of hot flushes compared with the raloxifene group, evident from as early as week 6. Vaginal atrophy was also assessed in SMART-1. Treatment with conjugated oestrogens/bazedoxifene was significantly more effective than placebo at increasing the mean proportion of superficial cells from baseline at most time points (p<0.001). The combination was significantly more effective than placebo at increasing the mean proportion of intermediate cells and decreasing the proportion of parabasal cells from baseline to all time points (p<0.001). The SMART-5 study compared the endometrial safety and bone mineral effects of conjugated oestrogens/bazedoxifene with bazedoxifene alone, combined hormone therapy (conjugated oestrogens 450 microgram/medroxyprogesterone acetate 1.5mg) and placebo. This randomised, double-blind phase III trial enrolled healthy women aged between 40 and 65 years with a uterus (n=1843). The primary endpoints were the incidence of endometrial hyperplasia and the change in lumbar spine bone mineral density at 12 months. At 12 months, the incidence of endometrial hyperplasia was low across all groups (<1%). The oestrogen/bazedoxifene group experienced a significantly greater increase in lumbar spine bone mineral density at 12 months than the placebo group, which showed a decrease in this parameter (+0.24% vs -1.28%, p<0.01). The increase in lumbar spine bone mineral density associated with oestrogen/bazedoxifene was greater than that observed with bazedoxifene alone (+0.07%) but less than that seen with oestrogen/medroxyprogesterone (+1.30%). Breast density, assessed as a secondary endpoint in a substudy of the SMART-5 trial, did not increase over the course of 1 year in women treated with conjugated oestrogens/bazedoxifene. Overall, there were no differences in incidences of adverse effects between treatment groups in SMART-5, although more patients in the oestrogen/medroxyprogesterone group discontinued the study because of adverse effects than in any other group (14.1% vs 7.0-7.6%). The most commonly reported treatment-emergent adverse effects in the oestrogen/bazedoxifene group were nasopharyngitis, headache, back pain, pain in extremity, breast tenderness and vaginal haemorrhage. In a pooled safety analysis of 5 oestrogen/bazedoxifene phase III trials, abdominal pain was the most frequent adverse effect of the combination.